The Niben River (known to the Khajiit as the River Malapi, sometimes called the Imperial Run) is a large river in Cyrodiil. Its source is Lake Rumare in the Heartlands and it empties into the Topal Bay. The upper and lower sections of the river are divided by a large bay, on the banks of which stands the city of Bravil. 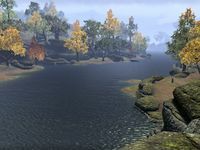 The land either side of the Lower Niben, where it flows through the region of Blackwood, is known as the Trans-Niben, and is frequently involved in border disputes between Cyrodiil, Black Marsh and Elsweyr. Just prior to 3E 432, the dispute on the Elsweyr side was officially settled in favor of Cyrodiil in an agreement between the Mane and the Count of Leyawiin. However, the Renrijra Krin objected to the settlement and focused their efforts on liberating the Trans-Niben for the Khajiit. 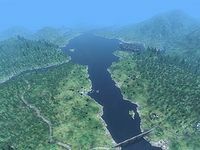 For game-specific information, see the Oblivion Niben River article. This page was last modified on 1 January 2019, at 17:41.